What a time to be alive! It’s the week before Halloweekend, and therefore officially the last time week you’re allowed to dress as your typical self. Next weekend wear a costume or be shunned! If the ginormous, otherworldly thunderstorm recently didn’t get you in a witchy autumnal mood then by golly, we may just have to cast a spell on you. It’s time to get spoopy. The festivities begin tonight with a fascinating visit from the infamous “Ravenmaster” at Atlas Obscura LA’s special author event. Meet Christopher Skaife as he speaks about his memoir and life caring for the seven ravens that live at The Tower of London — the legend goes, should a raven ever leave, the kingdom will fall. Anybody who likes a good, true story will enjoy this magical tale from the man who lived it! Afterwards drop by for Polartropica and Wild Moccasins as they provide serious upbeat tuneage with indie and electro pops vibes. Stay and groove, if you please. Thursday’s show featuring Creature Canyon has been relocated to Boardner’s in Hollywood, but don’t fret, all advance tickets will be honored. New plans include a show from legendary Venice Beach thrash metal band Beowülf with support from Nomads, Countime and Loss For Concern. The weekend begins Friday as Resident soul queen Miss Jackie Jackson returns to school us all in how to be fabulous from head to toe. Come ready to shimmy as she serenades the crowd and transports you to a soulful plane you didn’t even know existed. It ain’t every friday you get to hang out with royalty, baby! The weekend continues with a special Saturday shindig, brought to you by our friends at Dr. Martens! Wild times await you at their free annual showcase featuring three of our favorite bands, Pinky Pinky, Miserable, and the most recent addition, Tierra Del Fuego. Space is limited so make sure to RSVP and we’ll see you there. On Sunday we’ve partnered with AIDS Walk Los Angeles at APLA Health to invite participants in the walk to join us in the garden for drink specials to benefit the cause. Sign-up to join in the walk and stop by afterwards for celebratory beverages. With Halloweekend just around the corner, it’s time to commit to a costume and celebrations. In addition to a Halloween themed Daft Brunch and Bootie LA, we’ve added another rager on the spookier end of things to close out the weekend known as Carrie Prom. If you like gore, horror, and nightmares, this fiesta will fulfill all of your dark desires! 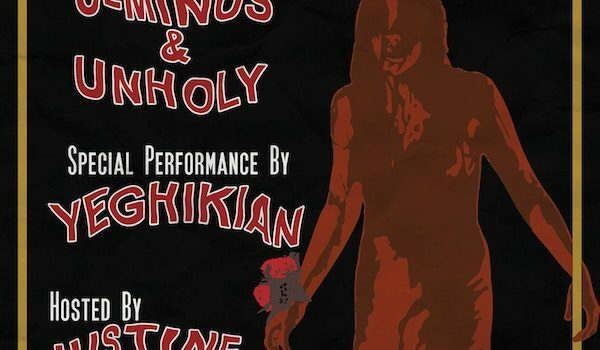 C-Minus and DJ Unholy will be spinning in addition to a live performance by Yeghikian at this NanceArte production. Come dressed to impress…..or else. Plus don’t forget to plan a pregame stop at the Holger Hut in the garden for your pick of tiki beverages. We know you love rum, tiny paper umbrellas, and all things coconut. Once the holiday has come and gone we enter the heart of fall, and dare I say winter. As the days get shorter and darker you’ll need fun things to fill up your calendar — our first solution is, of course, 60s dance craze party Green Slime. The fun returns 11/3 with a special edition featuring a night of Spanish gems from the 1960s, including a performance from Los Hurricanes. Highly recommend not missing this! Flash forward to the end of the month and all eyes will be on electronic music makers StayLoose and Brothel on 11/30 as Live Nation co-presents these exciting artists setting off big waves. Lastly, try not to freak out but we just announced a show for next year. Yes, on 1/18/2019 Brendan Kelly will grace our stage and you’ll want to be there. If you needed reassurance that the coming year will be okay, look no further. Brooklyn Vegan is backing us up on this one. With that said, it’s time to consume a bag full of candy corn and spend hours online searching for the perfect costume inspo. Trade in your favorite old band tee full of holes for a weird and festive get-up, please. We beg of you. But really, dress as you please and just come drink some witches brew at the very least. It’s that time of year.